The Muslim Rights Concern, MURIC, have released a statement rejecting the June 13th date fixed for the NYSC Batch A (Stream II) orientation course, arguing that the Muslim graduates expected to participate in the orientation will be fasting as the date clashes with their Ramadan fasting. The Muslim Rights Concern, MURIC, have released a statement rejecting the June 13th date fixed for the NYSC Batch A (Stream II) orientation course, arguing that the Muslim graduates expected to participate in the orientation will be fasting as the date clashes with their Ramadan fasting. The group argues that it would be very strenuous for Muslims to be fasting and also participate in the challenges task set for them during their orientation camp. 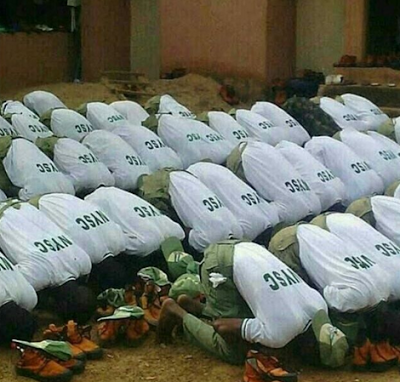 “IT IS ILLEGAL, UNLAWFUL AND UNCONSTITUTIONAL FOR NYSC TO HOLD CAMP AT A TIME WHEN ITS MUSLIM MEMBERS WILL BE DEPRIVED OF THEIR FREEDOM OF WORSHIP AND THE LIBERTY TO PRACTICE THEIR CREED WITHOUT FEAR. THIS PLANNED CAMP IS EXCLUSIVE, DISCRIMINATORY AND PAROCHIAL. WE DO NOT WANT TO BELIEVE THAT THE SHIFT WAS DELIBERATELY PLANNED TO COINCIDE WITH THE RAMADAN SEASON WITH A VIEW TO EXCLUDING PROSPECTIVE MUSLIM CORPERS. MURIC IS NOT TRYING TO INDULGE MUSLIM YOUTHS. FASTING IS NO JOKE AND IT CERTAINLY CANNOT BE COMBINED WITH THE PHYSICAL CHALLENGES WHICH CHARACTERIZE THE NYSC CAMP. FIRSTLY, MORNING DRILLS IN NYSC CAMPS ARE KNOWN TO BE RIGOROUS AND THE SOLDIERS IN CHARGE WILL NOT TAKE EXCUSES. DEHYDRATION SETS IN LATER IN THE DAY PARTICULARLY IN THE HOTTER REGIONS OF NIGERIA. SECONDLY, ADEQUATE SAHOUR (EARLY MORNING MEAL TAKEN APPROXIMATELY BETWEEN 4 AM AND 5.15 AM) CANNOT BE GUARANTEED IN THE NYSC CAMP. NEITHER CAN THE FUTURE (MEAL TAKEN AT SUNSET TO BREAK FAST ) BE TIMELY AS CAMP SCHEDULES ARE BOUND TO IGNORE AND SUBSUME THIS VERY IMPORTANT PERIOD. THIRDLY, ATTENDING ORIENTATION CAMP AND PARTAKING IN THE ENERGY-SAPPING ACTIVITIES ON EMPTY STOMACH IS AN INDUBITABLE INVITATION TO HEALTH CRISIS. NYSC MAY THEREFORE BE INVITING MUSLIM CORPERS TO STEP ON LANDMINES IN THE PLANNED ORIENTATION CAMP IF IT HOLDS AS PRESENTLY SCHEDULED.